The Clover thread Cutter Pendant is perfect for your travel needs. 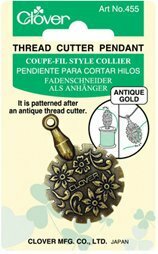 The Clover Thread Cutter Pendant is perfect for your needlepoint threads, cotton, silks and fine wool. The Clover Thread Cutter Pendant comes in antique brass or silver. If only stitching with heavy wool you may want to use the Yarn Cutter Pendant.